SonSon is an arcade game released by Capcom in 1984. It is a blend of a side scrolling action game and a shooter game. It is Capcom's tribute to a Chinese legend called "Xiyou Ji" ("Journey to the West") considered to be one of the four classic pieces of Chinese literature. The main character in Xiyou Ji is Sun Wukong, or, when you pronounce the words as if they were Japanese kanji, Son Gokuu. That is the same story that inspired the design of the character Son Goku from the Dragon Ball and Dragon Ball Z series. It is possible to play the game co-operatively with partner who plays as the pig TonTon (Zhu Wuneng in the original story). In the game, you control the monkey named SonSon in an attempt to reach the statue of Buddha. In order to do that, SonSon (and if present, pig partner TonTon) must travel across 20 long and increasingly dangerous sections, fighting off animals, monsters, and other enemies. The screen scrolls to the right automatically, and players must push up or down to jump from one ledge to another. Enemies tend to attack in groups, and bonus points are awarded for defeating entire groups, as well as for collecting bonus items. 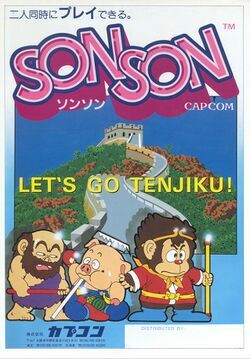 SonSon was never converted for play in the United States, and was only made available for the Famicom in Japan until the title started showing up in several classic Capcom compilations several years later. Several elements from SonSon, including the monkey himself, have made cameos in many of Capcom's later games. SonSon was also the name of a selectable character in Marvel vs. Capcom 2, although that SonSon was supposedly a female descendant of the SonSon from this game. A sequel called SonSon II was released exclusively for the PC Engine. SonSon was traveling with a monk friend of his to visit the large statue of Buddha far to the west of his home. Along with them where a turtle, and horse, and TonTon the pig. All of a sudden, one of the greater devils assigned to capture them appeared. He managed to grab the monk, the turtle, and the horse in one fell swoop and flew away with them. Now SonSon and TonTon are left with the task of rescuing their comrades and making it to the Buddha statue once and for all. You control SonSon (or TonTon) through a series of automatically horizontally scrolling stages. As you move, you can jump up or down to the next ledge at will. You can fire bullets from the sticks that you carry. The bullets travel about halfway across the screen before disappearing. Enemies appear at predetermined times in groups or waves. Bonus points are awarded if the entire group is destroyed. Touching any of the enemies, or the bullets that they shoot at you is lethal and costs one life. Bonus items such as fruits and vegetables can be collected for bonus points. Some bonus items appear out of the ground if you walk across the right spot. Collect a POW item when you see one, to turn every enemy present on the screen at that time into a bonus item. At certain points along the way, you will be forced to stop and shoot down barriers while three great devils attack you. As you travel, the sections count down. The goal is to make it to the Buddha statue at the end of the final section. This page was last edited on 29 March 2010, at 08:31.